Dipsticks have two indicators (pinholes, lines, “min” and “max”) or a crosshatch that should be compared with the oil level. Low: At “low” mark or less than halfway between marks: Top up to “full” mark. Depending on the model of the car, the oil dipstick usually has a yellow handle, while the transmission dipstick usually has a red handle. This is not always the case, but it is common with cars made in 1995 and on. Additionally, starting around 1995, manufacturers began placing text on the handle to label it as “transmission” or “oil”. Also, please keep in mind that transmission fluid tends to have a pink/reddish color, while motor oil is a brown/black color. 1. Locate: Locate the oil filler cap, usually marked with the word “oil” or an oil can icon. Make sure it’s for oil and not another fluid, wipe away dirt and dust from the cap, and remove the cap. 2. Reference: Refer to your owner’s manual, to estimate how much oil to add. If the oil level was between marks, this will usually be less than a quart. 3. Pour: Using a CLEAN funnel if desired, pour oil through the opening into the engine. Pour slowly to avoid spills. Dipsticks have two indicators (pinholes, lines, “min” and “max”) or a crosshatch that should be compared with the oil level. 4. Repeat: Ensure the oil is filled to the proper level. Again, be sure not to overfill. Wipe off any spills and replace the cap. Check that the cap is secured. – Check the oil every other time you fill up. – Consult your owner’s manual to determine whether to check the oil when it’s cold or at operating temperature. 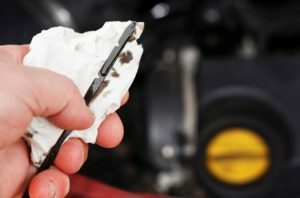 – Before checking oil, make sure the engine has been off at least 10 minutes so oil settles back into the oil pan and you don’t get a false reading. – Park on flat, level ground for reliable dipstick readings. – Examine the oil. Golden is still new enough; very dark indicates the need for an oil change. Other colors, milky globs or metal particles could indicate other fluid leaks or worse. – Avoid overfilling — pour a little oil in and then recheck the level. – If your oil is constantly low, it could indicate a leak. Before taking your car to a mechanic, try “No Leak” engine oil. – Change the oil when it’s dirty or at intervals of about 3,000 miles.